Jinhua Miyue Crafts Co., LTD is proud to give you the best glass awards and trophies. Each of the items is in good quality. We devote time and effort makes each glass award unique to achieve your satisfaction. 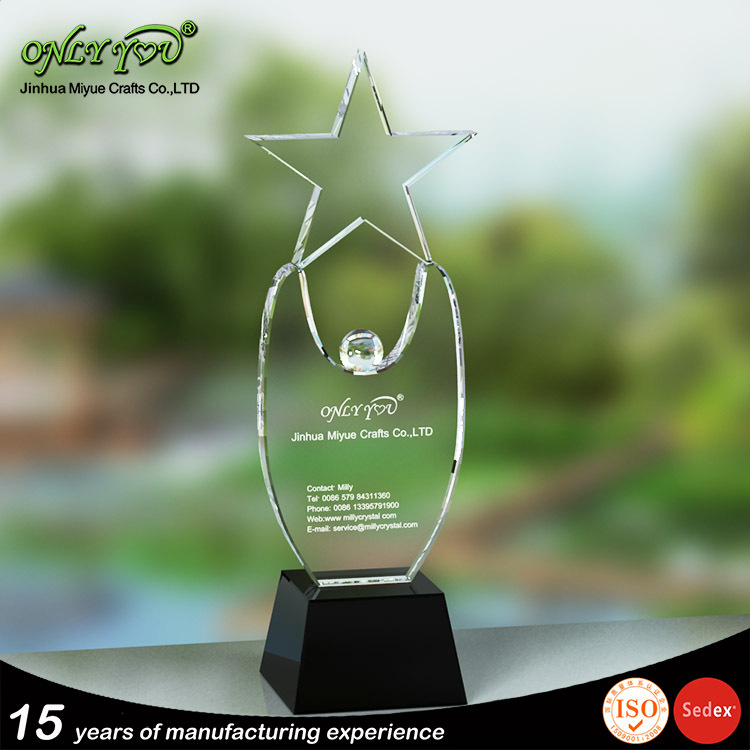 From the cutting to the engraving process, we make sure the creation and design of the awards are excellent. Customers would have a variety of choices that suit different events and occasions. You can customize the awards depending on the design you want. We do our best to give you a creative design that’s perfect for the awarding ceremony. Our team of experts models the awards and trophies after perfection. So you can be sure the best products would be yours. We make sure that each award has a unique blend of design and creativeness. You wouldn’t go wrong in choosing our products. You can acknowledge the competence of your top performers in the company with a customized award. Are you looking for the best glass awards? We know and understand the needs of our clients. So, we use a unique approach in each of these awards. You can see a beautiful logo or engraving on the glass. We pay close attention to details, so you have assurance each glass awards is unique. You pick your choice right now and see the big difference each glass award offers you! Glass awards have a delicate and captivating look. You can select the style and type of engraving you want the glass to have. It has a fine and smooth texture that blends with its design. You can expect that our awards are perfect for ceremonies and recognition due to its quality. Yes, Jinhua Miyue Crafts Co., LTD makes sure our products are of good quality. You can marvel at the time by looking at its design. You can make an awarding ceremony extra special by having our elegant awards. We give assurance that each award is customized according to the theme of the recognition. You select the best awards that you like! Jinhua Miyue Crafts Co., LTD offer clients a broad choice of glass awards. It’s due to the different sizes and colors it has. Whether it’s a company organization or awarding ceremony, we have the right awards for you. The designs we have in our awards match the style of the glass. We think of the best ways to capture your ideas and turn it into glass award. We aim to discover new methods and techniques to make the design process excellent. We also don’t disappoint you when it comes to the colors of the glass. With our diverse color choices, you don’t have any problem with selecting the right color you like. We welcome you to select the glass awards you would love to have. What to Expect from Our Glass Awards? Jinhua Miyue Crafts Co., LTD focuses perfection in its work. We take great effort to match the design, color, and size of the glass. We aim to give you the satisfaction you like. So, what can you expect from our glass award items? The glass awards of Jinhua Miyue Crafts Co., LTD come at an affordable price. We offer you comfort in buying the product. So, you would be happy to offer a low price for the items. Customers also have a chance to order in single and bulk orders. If you call us now, you can expect fast delivery of the glass items. Here at Jinhua Miyue Crafts Co., LTD, we take care of your orders right away. We get a few details about you such as your name, age, address, etc. Then, we safely deliver the items you want. Level up your company awarding or ceremonies with our glass awards. We offer you a 100% guarantee of our awards are the best items you need in the event. You can be sure that it has a high quality you would like. Feel free to call our team and have the best service you deserve. The rich variety of glass awards make it suitable for all customers.